Observed on foliage of a vine, Cyphostemma, on a pasture fence near Eldoret, Kenya. December 2013. Length is 4 to 5 mm. 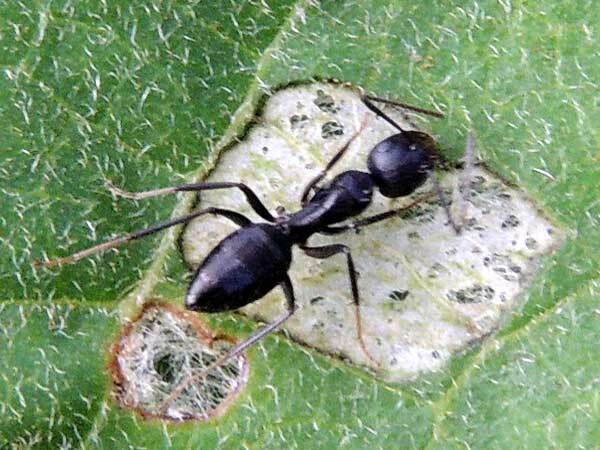 This carpenter ant is a generalized predator of mostly small insects and as such is probably a benefit to the plant on which it is hunting; it might possibly prey upon the moth larva that chewed the leaf. The ant can eject formic acid if disturbed and so would not itself be a good food item for a bird. Copyright Michael J. Plagens, Page created 15 March 2014.